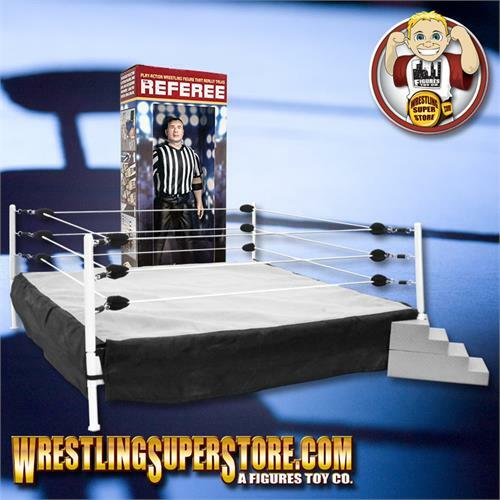 Special Deal: Wrestling Ring for Action Figures & Talking Referee Figure. Three Counting and Talking Referee Action Figure by Figures Toy Company. Squeeze his legs together and he will throw his arm up and say five different sayings! This goes great with your other wrestling action figures and accessories. Takes 3 LR44 watch batteries (included). Figure measures 7 inches tall and comes in clamshell packaging. A WrestlingSuperstore.com exclusive! "Get rid of the foreign object! 1, 2, 3, 4"
"Hey, get back in the ring! 1, 2, 3, 4"
"Alright, that's it, you're disqualified! (bell rings)"
"Alright now, break the hold, he's on the ropes! Come on, break it!"